Dendritic cells (DCs) are central modulators of immune responses and, therefore, interesting target cells for the induction of antitumor immune responses. Ag delivery to select DC subpopulations via targeting Abs to DC inhibitory receptor 2 (DCIR2, clone 33D1) or to DEC205 was shown to direct Ags specifically to CD11c+CD8− or CD11c+CD8+ DCs, respectively, in vivo. In contrast to the increasing knowledge about the induction of immune responses by efficiently cross-presenting CD11c+CD8+ DCs, little is known about the functional role of Ag-presenting CD11c+CD8− DCs with regard to the initiation of protective immune responses. In this study, we demonstrate that Ag targeting to the CD11c+CD8− DC subpopulation in the presence of stimulating anti-CD40 Ab and TLR3 ligand polyinosinic-polycytidylic acid induces protective responses against rapidly growing tumor cells in naive animals under preventive and therapeutic treatment regimens in vivo. Of note, this immunization protocol induced a mixed Th1/Th2-driven immune response, irrespective of which DC subpopulation initially presented the Ag. Our results provide important information about the role of CD11c+CD8− DCs, which have been considered to be less efficient at cross-presenting Ags, in the induction of protective antitumor immune responses. Melanoma is the most severe type of skin cancer, with a mortality of 80–90%, and it affects young adults, as well as older people (1). Despite promising progress in the development of new therapies, the treatment of advanced melanoma remains challenging. In general, tumors are poorly immunogenic because they express reduced levels of Ags, MHC, and costimulatory molecules (2). Moreover, without external stimuli, tumor cells do not release danger signals, which are needed for dendritic cell (DC) maturation and efficient T cell activation (3). To overcome the low tumor immunogenicity, new therapeutic strategies based on the initiation of DC maturation by different adjuvants and the presentation of tumor Ags to T cells are under intense investigation (4–7). Because of their role as key regulators for the coordination and balance of innate and acquired immune responses, DCs are good candidates to modulate the immune system’s activity in infection, cancer, and autoimmunity (3, 8). The DC network consists of various subsets with distinct cell surface markers, developmental origin, and biological functions (9–12). Three main subpopulations of DCs have been described in murine lymphoid organs: CD11chighCD8+ DCs, CD11chighCD8− DCs, and CD11cintPDCA1+ plasmacytoid DCs (8–18). In addition to the presentation of Ags as peptide–MHC class II complexes and the initiation of CD4+ T cell responses, CD11c+CD8+ DCs are specialized in capturing dying cells (16) and cross-presentation of Ags on MHC class I, allowing them to induce cytotoxic T cell responses (13–15, 17, 18). In contrast, CD11c+CD8− DCs were described to be rather specialized in the presentation of antigenic peptides on MHC class II and in the initiation of CD4+ T cell responses (15, 19). For an efficient activation of immune responses, DCs express an array of molecules that are responsible for sensing danger signals, leading to their maturation and enabling them to efficiently induce T cell responses. Detection of danger signals and Ag uptake are mediated by pattern recognition receptors, such as TLRs and C-type lectin receptors (16, 20). The latter were described to rapidly internalize after binding of conserved parts of pathogens, such as lipids, sugar residues, or nucleic acids (16), as well as after binding of specific Abs (13, 21). Recently, it was shown that DC subpopulations express unique repertoires of endocytic C-type lectin receptors (22). In the steady-state, DEC205 (CD205, Ly75 Ag) and Clec9A (DNGR-1) are solely expressed on CD11c+CD8+ DCs, whereas DC inhibitory receptor 2 (DCIR2; 33D1 Ag) is expressed most prominently on CD11c+CD8− DCs (15, 23). Several groups showed that the specific delivery of model Ags, viral Ags, or bacterial Ags, via Abs directed against the C-type lectin receptors DEC205 or Clec9A, to cross-presenting CD11c+CD8+ DCs is a potent method to induce efficient CD4+ and, especially, CD8+ T cell responses accompanied by humoral immune responses in vivo (13, 19, 21, 24–27). In contrast, Ag targeting via anti-DCIR2 Abs led to the induction of prominent CD4+ T cell responses in vivo (15, 19). Despite the evaluation of the induction of in vivo T cell responses after Ag targeting, long-term survival analyses have been performed only in a murine breast cancer or a melanoma cancer model in which Ags were solely targeted to CD11c+CD8+ DCs (28). The tumor Ag Her2/neu (29), OVA protein, or tyrosinase-related protein 2 (30, 31) were fused or chemically conjugated to murine DEC205 Abs (23, 28–30). Recently, murine CD11c, a member of the integrin superfamily and a broad marker of all murine DC subpopulations, NK cells, B cells, macrophages, T cells, and monocytes (32–36), was targeted as a single-chain Fv Her2/neu fusion protein, thus demonstrating the potency of other endocytic receptors in the induction of protective tumor responses against breast cancer cells (37). Of note, the delivery of Ags to CD11c+CD8− DCs via DCIR2, but not via DEC205 on CD11c+CD8+ DCs, induced full protection against Yersinia pestis bacterial infection (26), thereby indicating a potent role for CD11c+CD8− DCs in the resolution of bacterial infections. Importantly, the induction of protective immune responses after initial T cell priming by CD11c+CD8− DCs has not been studied in mouse tumor models. In this study, we analyzed the induction of immune responses after delivery of Ags to DCIR2 on CD11c+CD8− DCs and to DEC205 on CD11c+CD8+ DCs in the presence of stimulating anti-CD40 Ab and TLR3 ligand polyinosinic-polycytidylic acid [poly(I:C)] (anti-CD40/pIC). Independently of the targeted DC subpopulation, DCIR2 and DEC205–mediated Ag delivery caused mixed Th1/Th2-driven responses shown by the generation of different Ab subclasses in the serum of C57BL/6 recipient mice. T cell assays illustrated that similar Th1 CD4+ and robust CD8+ cytotoxic T cell responses were induced after delivery of Ags to CD11c+CD8− DCs by targeting DCIR2 compared with the delivery of Ags to CD11c+CD8+ DCs by DEC205 targeting. In this study, we show for the first time, to our knowledge, that not only delivery of Ags to CD11c+CD8+DEC205+ DCs, but also delivery of Ags to CD11c+CD8−DCIR2+ DCs, allows for prolonged survival and low tumor burden. Six- to eight-week-old female C57BL/6 mice were purchased from Janvier (Saint-Berthevin, France) and maintained under specific pathogen–free conditions. Experiments were performed according to institutional and national guidelines. Chicken OVA–expressing B16F10 melanoma cells (B16F10-OVA, also known as MO4 cells) were kindly provided by R. Steinman (Rockefeller University) (38). Cells were cultured in RPMI 1640 (Invitrogen) supplemented with 5% heat-inactivated FCS (Biochrom), 100 U/ml penicillin, 100 μg/ml streptomycin (Invitrogen), 2 mM l-glutamine (Invitrogen), and 1 mM sodium pyruvate (Invitrogen). The hybridoma 1C10, which produces the anti-CD40 Ab, was obtained from Dr. F. Lund (University of Rochester School of Medicine, Rochester, NY) and cultured under serum-free conditions in ISF-1 medium (Biochrom) supplemented with 100 U/ml penicillin and 100 μg/ml streptomycin. Anti-CD40 Ab was purified from cell culture supernatants by protein G-Sepharose (GE Healthcare). The Ab batches were tested for endotoxin contamination (<0.1 EU/μg), as described previously (15, 39). The cloning of the used OVA-carrying Abs, chimeric anti-murine DCIR2 (33D1) Ab genetically fused with OVA (anti-DCIR2–OVA) or chimeric anti-murine DEC205 Ab genetically fused with OVA (anti-DEC205–OVA), or isotype-control Ab genetically fused with OVA (Iso-OVA; clone GL117) was described previously (15, 21). Hybrid Abs were produced in HEK293T cells after transient transfection using calcium phosphate, as described (15, 21). Abs were enriched via ammonium sulfate precipitation, dissolved in PBS, dialyzed, and purified via protein G Sepharose (GE Healthcare). Endotoxin was removed by Triton X-114 treatment (Sigma) (40), and Abs were tested for endotoxin contamination (Lonza; <0.1 EU/μg). Proteins were controlled by SDS-PAGE and Coomassie staining, as described previously (15, 41). Briefly, 5 μg each of purified anti-DCIR2, anti-DEC205, isotype, anti-DCIR2–OVA, anti-DEC205–OVA, and Iso-OVA was loaded in loading dye (0.5 M Tris/HCl [pH 6.8], 10% SDS, 87% glycerol, 1% bromophenol blue, 0.2 μM EDTA [pH 8] in dH2O) onto 4–20% Tris/Glycine gels (Serva). Gels were run in Tris/Glycine/SDS buffer containing 25 mM Tris, 19.2 mM glycine, and 1% SDS. SDS-PAGE marker was obtained from Thermo Scientific. Gels were stained in Coomassie blue buffer for 30 min (30% methanol, 10% acetic acid, 0.1% Coomassie Brilliant Blue R-250 in dH2O) and subsequently destained for 2–3 h (30% methanol, 10% acetic acid in dH2O). Each batch of Ag-targeting Abs was tested for its stimulatory capacity via in vivo T cell–proliferation assays, as described (15). Six- to eight-week-old C57BL/6 mice were injected i.p. with 10 μg anti-DCIR2–OVA or anti-DEC205–OVA in the presence or absence of 50 μg anti-CD40 Ab (clone 1C10) and 50 μg poly(I:C) (InvivoGen) (anti-CD40/pIC). Control groups received Iso-OVA Abs, with or without anti-CD40/pIC, anti-CD40/pIC alone, or PBS. After 8 or 21 d, splenocytes were isolated and cultured with the OVA peptide library pool (2 μM each of EQLESIINFEKLTEW, SIINFEKLTEWTSSNV, EKLTEWTSSNVMEER, EWTSSNVMEERKIKV, SNVMEERKIKVYLPR) (39) in supplemented RPMI 1640 medium containing 5% heat-inactivated FCS, 2 mM l-glutamine, 50 U/ml penicillin, 100 μg/ml streptomycin, 1 mM sodium pyruvate, and 50 μM 2-ME for 6 h in the presence of 2 μg/ml anti-CD28 Ab (clone 37.51; BD Biosciences) and brefeldin A (5 μg/ml; BD Biosciences). Control splenocytes were incubated with either 1 μg/ml anti-CD3 (clone 17A2; BioLegend) and 2 μg/ml anti-CD28 or with anti-CD28 alone. Six hours later, cells were washed with PBS/2% FCS, fixed, and permeabilized (Cytofix/Cytoperm kit: BD Biosciences). Unspecific Ab–FcR interaction was circumvented by blocking with anti-CD16/32 (FcγRIIB/III) (2.4G2; Bio X Cell) and anti-FcγRIV (9E9; produced in-house), followed by staining with the Abs anti-TCRβ–PE–Cy5 (H97-597; eBioscience), anti-CD8–PE–Cy7 (53-6.7; BioLegend), anti-CD4–Brilliant Violet 510 (RM4-5; BioLegend), anti-CD45R(B220)–Alexa Fluor 647 (RA3-6B2; BioLegend), anti-NK1.1–allophycocyanin–eFluor 780 (PK136; eBioscience), and IFN-γ–Alexa Fluor 700 (XMG1.2; BD Biosciences). Cells were analyzed by flow cytometry. Single-splenocyte suspensions from C57BL/6 mice were prepared by Collagenase D/DNase I digestion (15), and unspecific Ab–FcR interaction was circumvented by blocking with anti-CD16/32 (FcγRIIB/III) (2.4G2; Bio X Cell) and anti-FcγRIV (9E9; produced in-house). Subsequently, cells were stained with purified, Alexa Fluor 647–labeled anti-DEC205–OVA, anti-DCIR2–OVA, or Iso-OVA, followed by staining with Abs against CD8–PE–Cy7 (56-6.7; BioLegend), CD11b–PerCP–Cy5.5 (M1/70; BioLegend), CD11c–allophycocyanin–eFluor 780 (N418; eBioscience), CD45R(B220)-FITC (RA3-6B2; eBioscience), MHC-II–V500 (M5/114.15.2; BD Biosciences), or Ly6G-V450 (1A8; BD Biosciences). DAPI (1:20,000 of a 1 mg/ml solution) was added shortly before FACS analysis for exclusion of dead cells. Alexa Fluor 647 labeling was performed as described by the manufacturer (Life Technologies). FACS samples were acquired on a FACS Fortessa (BD Biosciences), and data were analyzed with FlowJo software (TreeStar). Mice were primed by i.p. injection of 1 μg anti-DCIR2–OVA or anti-DEC205–OVA in the presence or absence of 50 μg anti-CD40 Ab (clone 1C10) and 50 μg poly(I:C) (InvivoGen). Control groups received Iso-OVA Ab, with or without anti-CD40/pIC, anti-CD40/pIC alone, or 100 μg LPS-free OVA (Sigma; endotoxin removed by Triton X-114 treatment) (15, 40) precipitated in alum (Pierce). All mice were boosted by i.p. injection of 10 μg soluble endotoxin-free OVA protein 3 wk after priming. A total of 2 × 105 B16F10-OVA cells was injected s.c. into the skin fold over the neck of C57BL/6 mice. Tumor cell growth was measured with calipers every second day. Mice that became moribund or had a tumor size > 400 mm2 were sacrificed. OVA-specific Abs were detected by ELISA using high-binding plates (Nunc) coated overnight with 5 μg/ml endotoxin-free OVA protein (Sigma; endotoxin removed by Triton X-114 treatment) (15, 40) in PBS. After washing with 0.02% Tween-20 in PBS, plates were blocked with PBS/2% FCS at room temperature. Serial dilutions of the sera in PBS/2% FCS were incubated overnight at 4°C. After washing, bound Abs were detected using HRP-conjugated, Fcγ fragment–specific, goat anti-mouse IgG (Jackson ImmunoResearch) or goat anti-mouse IgG subtype (Southern Biotech) Abs, followed by colorimetric assay using o-phenylenediamine substrate (Sigma). The reaction was stopped by adding 2 M H2SO4, and OD495 was measured using a VersaMAX microplate reader (Molecular Devices). The relative IgG anti-OVA binding activity of the sera was calculated from a standard curve obtained from a serum pool of OVA-immunized C57BL/6 mice and is presented as log10 Ab titer for each individual mouse. Data were analyzed with Graph Pad Prism software, and statistical significance was determined using the Mann–Whitney U test. Results are given as a mean + SD or as median ± SD. Survival curve comparison was performed using a log-ranked Mantel–Cox test. Statistical significance was stated if p values were <0.05. To establish a model system in which we could study the type of T cell response induced by Ag targeting to different DC subpopulations in naive mice in vivo, we produced Ag-targeting Abs genetically fused to the model Ag OVA. Those non-FcR binding mouse IgG1 Abs are specific for either DEC205 or DCIR2 (33D1). As we showed before, this allows for targeting of Ags specifically to either CD11c+CD8+ or CD11c+CD8− DCs in vivo (Fig. 1) (15). Production of Ag-targeting Abs. OVA was genetically fused to the C terminus of the non-FcR binding mouse IgG1 Fc region (N297A) of anti-DCIR2 or of anti-DEC205 and isotype (Iso) Abs. (A) Model of Ag-targeting Ab. (B) SDS-PAGE of purified anti-DCIR2, anti-DCIR2–OVA, anti-DEC205, anti-DEC205–OVA, isotype (Iso), and Iso-OVA Abs under reducing conditions. Molecular mass (kDa) is indicated on the left. (C and D) Flow cytometry of splenic DC subpopulations. (C) Gating strategy. (D) Graph overlay shows directly Alexa Fluor 647–conjugated anti-DEC205–OVA (dark gray, left panels), anti-DCIR2–OVA (dark gray, right panels), and Iso-OVA (light gray) binding on splenic CD11c+CD8+ and CD11c+CD8− DCs. Shown is one representative experiment of three. Naive C57BL/6 mice were injected with anti-DCIR2–OVA, anti-DEC205–OVA, or Iso-OVA in the presence (stimulating conditions) or absence (nonstimulating conditions) of a maturation stimulus (anti-CD40/pIC) (13, 28). After 8 and 21 d, splenocytes were isolated and incubated with an overlapping peptide containing OVA library pool (Figs. 2, 3, Supplemental Fig. 1) for the measurement of IFN-γ secretion by restimulated CD4+ and CD8+ T cells (Fig. 2, Supplemental Fig. 1), NK cells, and CD4+ or CD8+ NKT cells (Fig. 3, Supplemental Fig. 1) (39). In comparison with Ag targeting to DEC205 on CD11c+CD8+ DCs, we found that Ag delivery to CD11c+CD8− DCs by anti-DCIR2–OVA under stimulatory conditions induced a similar IFN-γ production in CD4+ T cells and a substantial IFN-γ production in CD8+ T cells after restimulation with an OVA library on day 8 (Fig. 2B, 2C). Interestingly, the IFN-γ production in CD4+ T cells appeared to be long lasting, because on day 21 after initial immunization, IFN-γ+ CD4+ T cells could be detected when Ags were targeted to either DC subpopulation (Fig. 2B, 2C). In contrast, the IFN-γ production by CD8+ T cells was only detectable on day 8 and decreased to control levels until day 21, especially when CD11c+CD8− DCs were initially targeted with Ags by anti-DCIR2–OVA. In comparison with the T cell–mediated IFN-γ production, we found only very few highly IFN-γ+ NK cells and CD4+ and CD8+ NKT cells on day 8 and even fewer IFN-γ+ cells on day 21 after initial immunization with the Ag-targeting Abs (Fig. 3B–G, Supplemental Fig. 1). Overall, only very weak responses were observed when the Ag-targeting Abs were injected without immune stimulus or when the control Ab was injected (Figs. 2B–E, 3B–G). Thus, we conclude that Ag targeting to DCIR2 on CD11c+CD8− DCs induces similar CD4+ and robust CD8+ T cell responses compared with Ag targeting of DEC205 on CD11c+CD8+ DCs in naive C57BL/6 animals. Immunization with Ag-targeting Abs under stimulating conditions primes OVA-specific T cells. C57BL/6 mice were immunized with 10 μg of anti-DCIR2–OVA, anti-DEC205–OVA (anti-DEC–OVA), or Iso-OVA in the presence or absence of 50 μg anti-CD40 Ab and 50 μg TLR3 ligand poly(I:C) (anti-CD40/pIC). (A) Experimental setup. (B–E) At 8 and 21 d after immunization, isolated splenocytes were restimulated with an overlapping OVA peptide pool in vitro. Dot plots (B and D) and box-and-whiskers plots (C and E) show the frequencies of single IFN-γ–producing NK1.1−B220−TCRb+ CD4+ (B and C) or CD8+ (D and E) T cells. One representative experiment out of five is shown in (B) and (D). (C and E) Statistical analysis of all five experiments was performed using the Mann–Whitney U test. **p < 0.01. ns, not significant (p > 0.05). Evaluation of IFN-γ production by NK and NKT cells. C57BL/6 mice were immunized with 10 μg of anti-DCIR2–OVA, anti-DEC205–OVA (anti-DEC–OVA), or Iso-OVA in the presence or absence of 50 μg anti-CD40 Ab and 50 μg TLR3 ligand poly(I:C) (anti-CD40/pIC). (A) Experimental setup. (B–G) At 8 and 21 d after immunization, isolated splenocytes were restimulated with an overlapping OVA peptide pool in vitro. Dot plots (B, D, and F) and box-and-whiskers plots (C, E, and G) show frequencies of single IFN-γ–producing NK1.1+TCRβ+ CD4+ NKT cells (B and C), NK1.1+TCRβ+ CD8+ NKT cells (D and E), and NK1.1+TCRβ− NK cells (F and G). One representative experiment of five is shown in (B), (D), and (F). Statistical analysis of all five experiments was performed using the Mann–Whitney U test in (C), (E), and (G). *p < 0.05, **p < 0.01. ns, not significant (p > 0.05). To study whether Ag targeting induced a humoral immune response in vivo, C57BL/6 mice were injected with the targeting Abs in the presence or absence of maturation stimuli (anti-CD40/pIC). Three weeks later, mice were boosted with endotoxin-free soluble OVA, and total serum OVA-specific IgG was determined after 7, 14, and 21 d (Fig. 4A). High titers of anti-OVA IgG Abs were measured after targeting anti-DCIR2–OVA or anti-DEC205–OVA in the presence of the maturation stimuli. The levels of anti-OVA IgG Ab titers were equally high and seemed independent of the targeted DC subpopulation. Notably, although 133-fold more Ag was applied when OVA protein was injected as an alum emulsion, the overall IgG Ab titer was at least one to two orders of magnitude lower compared with mice that were immunized with the Ag-targeting Abs in combination with the maturation stimulus (Fig. 4A, Supplemental Fig. 2A). 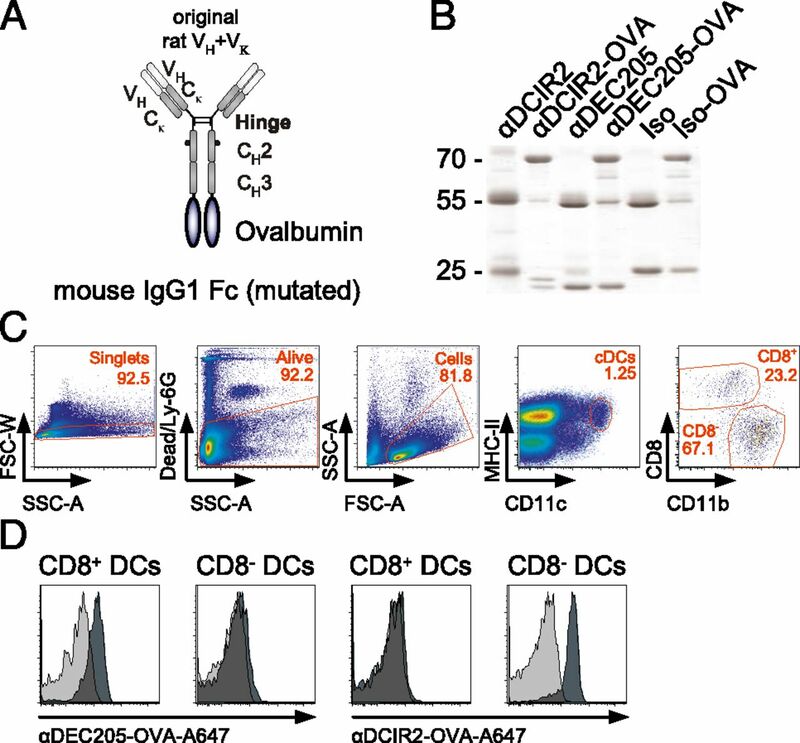 Control Iso-OVA Abs did not induce a measurable Ab response against the Ag, which also was true for mice that were immunized with the targeting Abs in the absence of the maturation stimulus anti-CD40/pIC (Fig. 4A, Supplemental Fig. 2A). Ag targeting to CD11c+CD8+ and CD11c+CD8− DCs induces the production of diverse Ab isotype subclasses. Five C57BL/6 mice were immunized with 1 μg of anti-DCIR2–OVA, anti-DEC205–OVA, or Iso-OVA in the presence or absence (Supplemental Fig. 2) of 50 μg anti-CD40 Ab and 50 μg TLR3 ligand poly(I:C) (anti-CD40/pIC) or alum-OVA. Twenty-one days later, mice were boosted i.p. with 10 μg endotoxin-free soluble OVA. 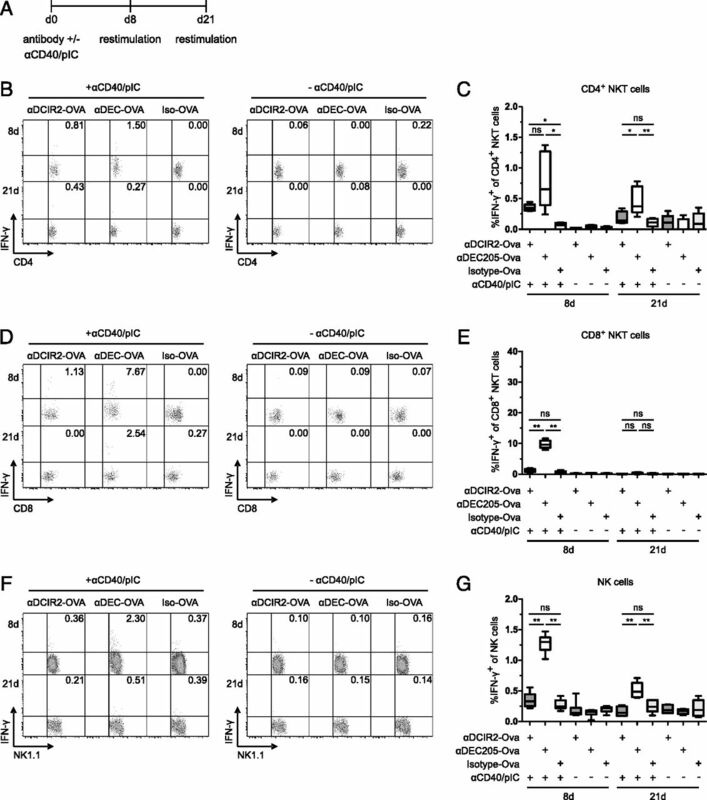 OVA-specific total IgG (A) and individual isotype subclass Ab titers of IgG1 (B and C), IgG2b (D and E), and IgG2c (F and G) were determined by ELISA 28, 35, or 42 d after primary immunization (7, 14, or 21 d after boost or 60, 32, 25, or 18 d prior to tumor cell application). Preimmune serum was used as control (day −60). Direct comparison of Ab titers of IgG1 (C), IgG2b (E), and IgG2c (G) of experimental groups of anti-DCIR2–OVA + anti-CD40/pIC–treated or anti-DEC205–OVA + anti-CD40/pIC–treated mice 28 d after primary immunization (day −32, or 7 d after boost). Data are mean and individual values for five mice/condition. Statistical analysis was performed using the Mann–Whitney U test, n.s., not significant. To examine the induction of Th1- or Th2-dependent Ab responses (42, 43), we analyzed the OVA-specific IgG subclass distribution in the sera of Ag-targeted mice. Class switching of IgG Abs is dependent on the surrounding cytokine milieu, with IL-4 inducing IgG1, IFN-γ inducing IgG2c and IgG3, and TGF-β inducing IgG2b Ab subclasses (44, 45). In the sera of mice immunized with the Ag-targeting Abs anti-DCIR2–OVA or anti-DEC205–OVA, we detected OVA-specific IgG1 (Th2), IgG2b, and IgG2c (Th1) Ab isotypes when the targeting Abs were injected in the presence (Fig. 4B–G), but not in the absence (Supplemental Fig. 2B–D), of the maturation stimulus anti-CD40/pIC. Of note, we found a faster (7 d after boost, day −32) and overall >1-magnitude higher production of IgG2b and IgG2c titers when CD11c+CD8− DCs were targeted with anti-DCIR2–OVA–targeted CD11c+CD8+ DCs compared with anti-DEC205–OVA–targeted CD11c+CD8+ DCs in the presence of the maturation stimulus (Fig. 4E, 4G). No OVA-specific Abs were produced when the animals were immunized with the Iso-OVA control Ab in the presence (Fig. 4B, 4D, 4F) or absence (Supplemental Fig. 2B–D) of the maturation stimulus Consistent with previous results, the Ab response in alum-OVA–injected animals was dominated by IgG1 (Fig. 4B, 4D, 4F) (39). The overall Ab titers of IgG2b and IgG2c were up to five orders of magnitude higher in mice initially immunized under activating conditions with either anti-DCIR2–OVA or anti-DEC205–OVA compared with Ab titers obtained from alum-OVA–injected animals (Fig. 4D, 4F). In summary, we conclude that Ag targeting under stimulatory conditions induces a broad spectrum of Ab isotypes with a faster switch to IgG2b or IgG2c Abs when CD11c+CD8− DCs presented the Ag in an anti-CD40/pIC–stimulated environment. Because Ag targeting led to strong CD4+ and CD8+ T cell responses, accompanied by specific Ab responses (Figs. 2, 4), we investigated whether the induced immune responses would be sufficient to suppress tumor cell growth in a syngeneic melanoma model expressing OVA as a model Ag. Therefore, we challenged mice 60 d after the initial induction of OVA-specific immune responses with the targeting Abs with a B16F10 melanoma cell line stably expressing OVA protein (B16F10-OVA) (Fig. 5A). We found that mice treated with anti-DCIR2–OVA or anti-DEC205–OVA in conjunction with the anti-CD40/pIC maturation stimulus showed a prolonged life span, which was accompanied by a markedly reduced and delayed tumor growth (Fig. 5B, 5C). In contrast, mice targeted under nonstimulatory conditions had no survival benefit because of the high tumor burden (Fig. 5C). The mean tumor size of mice treated with anti-CD40/pIC in combination with anti-DCIR2–OVA or anti-DEC205–OVA did not exceed 50 mm2 under stimulatory conditions, which is in strong contrast to the tumor sizes > 200 mm2 reached in mice that originally were immunized in the absence of immune stimuli (Fig. 5B). Mice that were immunized with control Iso-OVA Ab in the presence or absence of anti-CD40/pIC, anti-DCIR2–OVA, or anti-DEC205–OVA in the absence of anti-CD40/pIC, anti-CD40/pIC alone, or alum-OVA were not protected against rapidly growing tumor cells, as demonstrated by a median survival < 26 d (Fig. 5B). In contrast, mice that were primed originally with anti-DCIR2–OVA or anti-DEC205–OVA Abs in the presence of anti-CD40/pIC showed a significantly improved long-term survival, with a median survival of 45 or 63 d, respectively (p = 0.0135, anti-DEC205–OVA + anti-CD40/pIC/Iso-OVA + anti-CD40/pIC; p value = 0.0168, anti-DCIR2-OVA + anti-CD40/pIC/Iso-OVA + anti-CD40/pIC). We found no significant difference in survival between the Ag delivery under stimulating conditions to CD11c+CD8− or CD11c+CD8+ DCs with regard to overall survival of the mice. Preventive Ag targeting to CD11c+CD8+ and CD11c+CD8− DCs reduces tumor cell growth and prolongs survival. Sixty days prior to tumor cell application, five C57BL/6 mice each were injected i.p. with 1 μg of anti-DCIR2–OVA, anti-DEC205–OVA, Iso-OVA, or PBS in the presence (filled) or absence (open) of the maturation stimuli 50 μg anti-CD40 Ab and 50 μg poly(I:C) (anti-CD40/pIC) or Alum-OVA (*). On day −39 (21 d after immunization), mice were boosted with 10 μg endotoxin-free soluble OVA protein and challenged with 2 × 105 B16F10-OVA cells on day 0. (A) Experimental setup. (B) Mean tumor sizes. Lines were discontinued when >50% of the mice needed to be sacrificed because of high tumor burden or died (†). Data are mean + SD. (C) Survival shown as Kaplan–Meier plots for five mice/group. For future therapeutic application of Ag-targeting Abs, it is important to investigate whether the induced immune responses are capable of delaying or eradicating the growth of established tumors. To evaluate this, we injected the targeting Abs 5 d after inoculation of B16F10-OVA cells in the presence or absence of anti-CD40/pIC (Fig. 6A). Notably, mice in which Ags were presented either by CD11c+CD8+ (anti-DEC205–OVA) or CD11c+CD8– DCs (anti-DCIR2–OVA) under stimulatory conditions showed a delayed onset of tumor growth. Moreover, these mice showed a prolonged survival compared with the controls (median survival, 27 d for anti-DEC205-OVA + anti-CD40/pIC; 28 d for anti-DCIR2–OVA + anti-CD40/pIC; 18–21 d for controls; p = 0.0002 for anti-DEC205–OVA + anti-CD40/pIC/Iso-OVA + anti-CD40/pIC; p = 0.0027 for anti-DCIR2–OVA + anti-CD40/pIC/Iso-OVA + anti-CD40/pIC) (Fig. 6B, 6C). No significant difference could be observed between targeting Ags to DCIR2 or DEC205. All of the animals immunized with targeting Abs under tolerizing conditions died or had to be sacrificed within 28 d. Overall, our data suggest that the delivery of Ags to CD11c+CD8+DEC205+ DCs, as well as the delivery of Ags to CD11c+CD8−DCIR2+ DCs, delayed and reduced tumor growth and prolonged the survival of C57BL/6 mice also in a therapeutic setting. Therapeutic Ag targeting to CD11c+CD8+ and CD11c+CD8− DCs leads to reduced tumor cell growth and prolonged survival. Ten C57BL/6 mice each were injected s.c. with 2 × 105 B16F10-OVA cells. After 5 d, mice were treated with 1 μg of anti-DCIR2–OVA, anti-DEC205–OVA, Iso-OVA, or PBS in the presence (filled) or absence (open) of 50 μg anti-CD40 Ab and 50 μg poly(I:C) (anti-CD40/pIC) or alum-OVA (*). (A) Experimental setup. (B) Mean tumor size. Lines were discontinued when >50% of the mice needed to be sacrificed because of high tumor burden or died (†). Data are mean + SD. (C) Survival shown as Kaplan–Meier plot from 10 mice/group. In the last years, immunotherapies based on in vitro–generated human monocyte–derived DCs loaded ex vivo with tumor Ags were developed to treat patients suffering from malignant melanoma. Demonstrating the feasibility of this strategy, injection of tumor Ag–pulsed DCs into melanoma patients led to prolonged survival in select patients (46–50). Because the generation of this autologous monocyte-derived DC population is laborious and cost intensive and may only be available for a limited number of patients, alternatives need to be developed (51). Targeted delivery of Ags to DC surface receptors in vivo seems to be a very promising approach to break tumor-specific tolerance and to reactivate the immune system for recognition and elimination of tumor cells (51, 52). Several receptors expressed on the surface of conventional CD11c+CD8+ and CD11c+CD8− DCs, as well as plasmacytoid DCs, have been used for the delivery of Ags by targeting Abs, resulting in the induction of potent cellular and humoral immune responses in vivo (6, 8, 15, 23, 27–30, 37, 39, 53–55). Importantly, only one study investigated the induction of protective immune responses initiated by Ag-presenting CD11c+CD8− DCs against bacterial infection with Y. pestis (26). In this study, we found that the delivery of the surrogate model tumor Ag OVA genetically fused to the Ag-targeting Abs anti-DEC205 and anti-DCIR2 induced cellular and humoral immune responses in the presence of the maturation stimulus anti-CD40/pIC. Importantly, Ag presentation by both DC subpopulations led to a significant delay and reduction in tumor growth in the animal groups in protective and therapeutic settings. 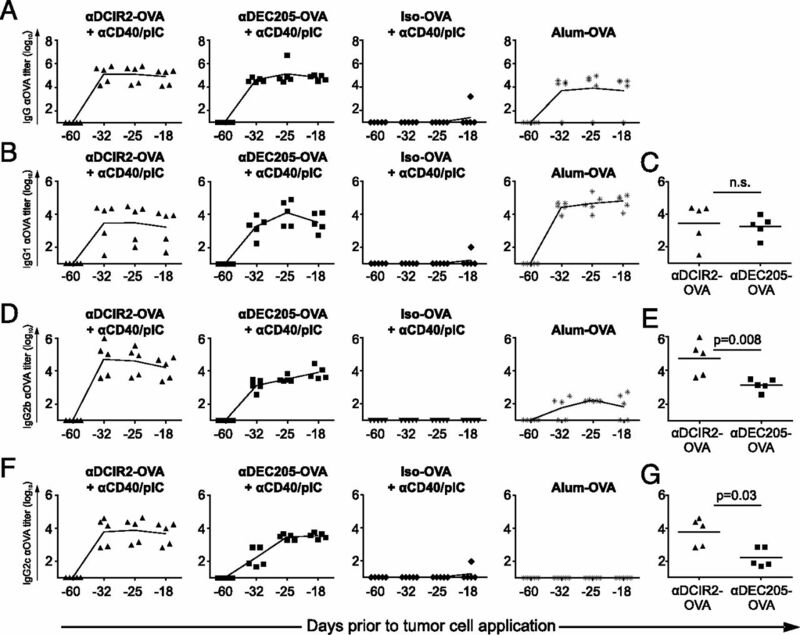 Induction of antitumor responses has not been compared between Ag-loaded CD11c+CD8+ and CD11c+CD8− DCs. To investigate whether we could induce an effective antitumor response by in vivo Ag targeting, we chose the well-established tumor melanoma model B16F10 stably transfected with the chicken OVA gene as a surrogate melanoma Ag (38). This poorly immunogenic model has a highly aggressive and metastatic nature and is used in many preclinical studies (38, 56). 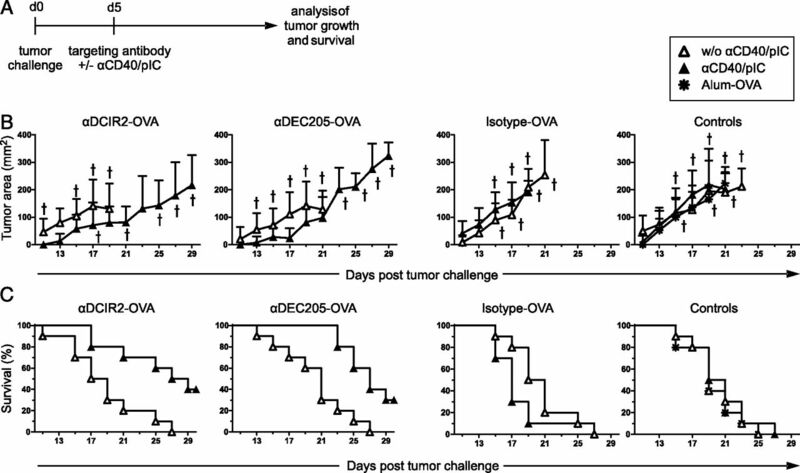 In tumor-protection assays in which we primed mice with anti-DCIR2–OVA or anti-DEC205–OVA in the presence of the maturation stimulus, we found a strongly delayed or even absent tumor progression (Fig. 5). The protective immune responses were independent of the DC subpopulation that was initially targeted and were similar to responses obtained by targeting chemically conjugated Ags via the anti-DEC205–OVA Ab (30). In addition, we observed no significant differences in the overall survival of mice initially immunized with anti-DCIR2–OVA or anti-DEC205–OVA, even in a therapeutic setting (Fig. 6). 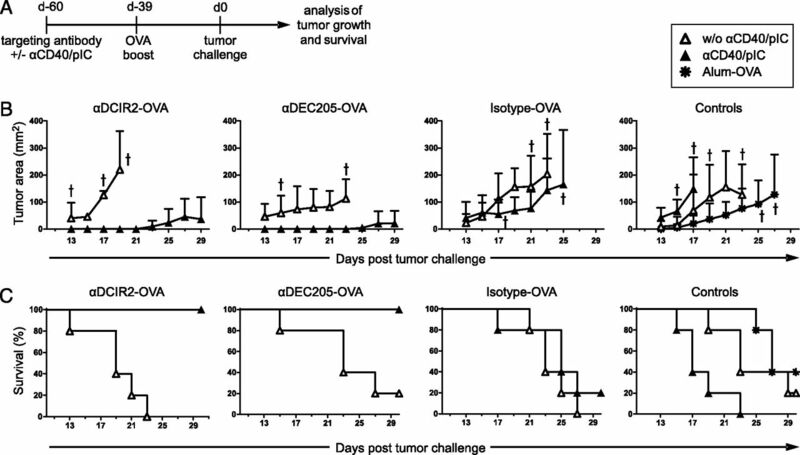 This might indicate that T cell responses induced by anti-DCIR2–OVA targeting were strong and fast enough to eliminate growing tumor cells (Fig. 2). Although we found some IFN-γ–producing NK and NKT cells, the main producers of IFN-γ were CD4+ and CD8+ T cells after targeting Ags to CD11c+CD8+ and CD11c+CD8− DCs (Figs. 2, 3). This is of critical importance, because it was demonstrated that both CD4+ and CD8+ T cell responses might be necessary for the prevention of tumor growth, because depletion of T cells markedly reduces survival (29, 38). As a further readout for Th cell–dependent immune responses, we investigated the induction of Ab isotype subclasses in the serum of immunized mice following DC targeting (Fig. 4). Although the Th1 cytokine IFN-γ leads to production of IgG2a (BALB/c) or IgG2c (C57BL/6), the Th2 cytokine IL-4 supports isotype switching to IgG1. In contrast, TGF-β directs the Ab class switch from IgM to IgG2b (39, 44, 45). Although we used 133-fold more Ag in alum/OVA-immunized mice, the overall IgG Ab titer was one to two magnitudes lower than the Ab titers reached in mice immunized with anti-DEC205–OVA/adjuvant or anti-DCIR2–OVA/adjuvant (Fig. 4A), thus demonstrating the efficacy of Ag targeting (13, 15, 21, 30, 39). When we analyzed the Ab isotype subclasses in the sera of DC-targeted animals, we found high Ab titers with a broad diversity of Ab isotypes (IgG1, IgG2b, and IgG2c) when anti-CD40/pIC was used as an adjuvant (Fig. 4B–G). This was independent of the targeted DC subpopulation. As shown before, most of the Abs in alum/OVA–injected animals were of the Th2-driven IgG1 subclass (39). 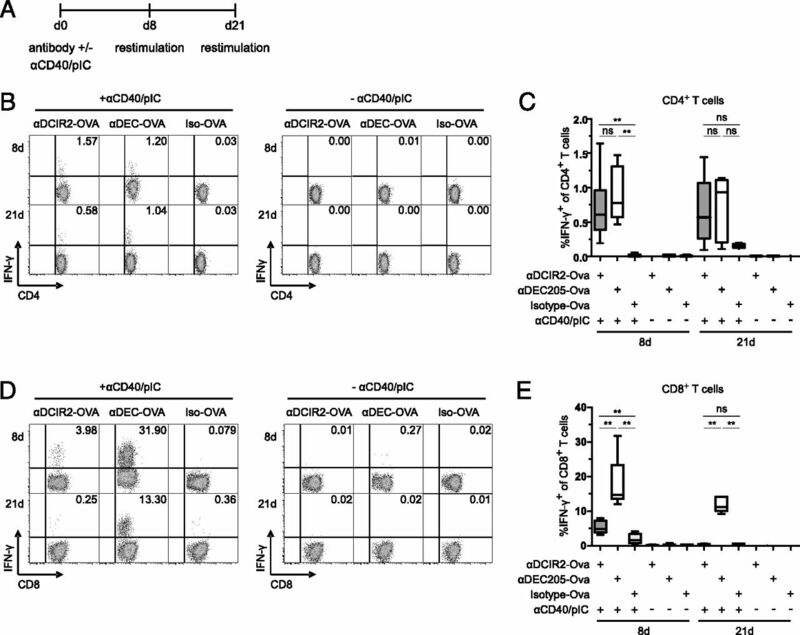 Targeting DCIR2, which is specifically expressed on CD11c+CD8− DCs, induced both Th1 and Th2 responses, reflected by IFN-γ–producing CD4+ T cells and IgG1 and IgG2c Ab isotype variants in C57BL/6 animals. This contrasts to targeting of DCIR2 in Th2-prone BALB/c mice, which predominantly elicited IL-4–secreting Th2 CD4+ T cell responses, whereas targeting to DEC205 induced the secretion of IFN-γ by Th1 CD4+ T cells (19, 43, 57). By investigating the isotype subclasses, we found up to three orders of magnitude more IgG2c and IgG2b Abs in anti-DCIR2–OVA/adjuvant–targeted animals compared with anti-DEC205–OVA/adjuvant–targeted animals 1 wk after the booster immunization (Fig. 4E, 4G). Later on, Ab titers equalized, and differences between anti-DCIR2–OVA/adjuvant–targeted animals and anti-DEC205–OVA/adjuvant–targeted animals were no longer detectable. We speculate that, although the frequency of IFN-γ–producing CD4+ T cells appeared similar at the time points of measurement (Fig. 2B, 2C), there might be other intrinsic differences in T cells or induced Th follicular cells, leading to different plasma cell frequencies and, thereby, slight shifts in the time course of production of IgG2b and IgG2c Abs. Future investigation of the regulation of isotype class switching by the different DC subpopulations will provide more insights helping to explain this finding. Taken together, we showed that targeting Ags to CD11c+CD8− DCs with an anti-DCIR2 Ab under stimulatory conditions provides a survival benefit and improves the antitumor responses against malignant melanoma. Upon Ag delivery, both DC populations had the ability to induce strong cellular and mixed Th1/Th2 humoral antitumor immune responses. We suggest that CD11c+CD8− DCs are also able to induce protective immune responses against tumor cells when Ags are delivered in combination with a maturation stimulus, strongly arguing for integration of both DC subsets into future immunotherapeutic approaches for the treatment of cancer. We thank R. M. Steinman for providing OVA-expressing B16F10 cells (B16F10-OVA; MO4), as well as F. Lund for providing 1C10 (anti-CD40 Ab–producing) cells. We also thank S. Beck, C. Weiss, and K. Weidner for excellent technical support and the members of the Dudziak and Nimmerjahn laboratories for critical comments. This work was supported in part by grants from the German Research Foundation (Emmy-Noether Program: DU548/2-1 and SFB643-TPA7 [to D.D. ], RTG1660-TPA1 [to D.D. and L.H. ], and SFB643-TPA8/B14 [to F.N.]). D.D. and F.N. are supported by BayGene. For parts of the study, D.D. received support from Erlanger Leistungsbezogene Anschubfinanzierung und Nachwuchsförderung (ELAN, intramural funding) and the Ria-Freifrau von Fritsch Stiftung. V.R.B. was a fellow of the Deutsche Studienstiftung. G.F.H. was supported in part by the German Academic Exchange Service. M.C.N. is a Howard Hughes Medical Institute investigator. D.D. was a fellow of the Young Colleague of the Bavarian Academy of Sciences. 2006. Melanoma. N. Engl. J. Med. 355: 51–65. 1987. The immunogenicity of tumour cells. Immunol. Cell Biol. 65: 271–277.
. 1998. Dendritic cells and the control of immunity. Nature 392: 245–252.
. 2012. Vaccination with mRNA-electroporated dendritic cells induces robust tumor antigen-specific CD4+ and CD8+ T cells responses in stage III and IV melanoma patients. Clin. Cancer Res. 18: 5460–5470.
. 2012. Antibody-antigen-adjuvant conjugates enable co-delivery of antigen and adjuvant to dendritic cells in cis but only have partial targeting specificity. PLoS ONE 7: e40208.
. 2007. Dendritic-cell immunotherapy: from ex vivo loading to in vivo targeting. Nat. Rev. Immunol. 7: 790–802.
. 2006. Triggering TLR signaling in vaccination. Trends Immunol. 27: 49–55.
. 2007. Taking dendritic cells into medicine. Nature 449: 419–426.
. 2010. Origin and development of dendritic cells. Immunol. Rev. 234: 45–54.
. 2010. The CD8+ dendritic cell subset. Immunol. Rev. 234: 18–31.
. 2007. Steady-state and inflammatory dendritic-cell development. Nat. Rev. Immunol. 7: 19–30.
. 2007. Intrinsic and cooperative antigen-presenting functions of dendritic-cell subsets in vivo. Nat. Rev. Immunol. 7: 543–555.
. 2002. Efficient targeting of protein antigen to the dendritic cell receptor DEC-205 in the steady state leads to antigen presentation on major histocompatibility complex class I products and peripheral CD8+ T cell tolerance. J. Exp. Med. 196: 1627–1638.
. 2002. Constitutive versus activation-dependent cross-presentation of immune complexes by CD8(+) and CD8(−) dendritic cells in vivo. J. Exp. Med. 196: 817–827.
. 2002. C-type lectin receptors on dendritic cells and Langerhans cells. Nat. Rev. Immunol. 2: 77–84.
. 2001. Cutting edge: intravenous soluble antigen is presented to CD4 T cells by CD8− dendritic cells, but cross-presented to CD8 T cells by CD8+ dendritic cells. J. Immunol. 166: 5327–5330.
. 2006. The dominant role of CD8+ dendritic cells in cross-presentation is not dictated by antigen capture. Proc. Natl. Acad. Sci. USA 103: 10729–10734.
. 2007. A subset of dendritic cells induces CD4+ T cells to produce IFN-gamma by an IL-12-independent but CD70-dependent mechanism in vivo. J. Exp. Med. 204: 1095–1106.
. 2011. Toll-like receptors and their crosstalk with other innate receptors in infection and immunity. Immunity 34: 637–650.
. 2001. Dendritic cells induce peripheral T cell unresponsiveness under steady state conditions in vivo. J. Exp. Med. 194: 769–779.
. 2009. Signalling through C-type lectin receptors: shaping immune responses. Nat. Rev. Immunol. 9: 465–479.
. 2008. Tumor therapy in mice via antigen targeting to a novel, DC-restricted C-type lectin. J. Clin. Invest. 118: 2098–2110.
. 2010. HIV gag protein is efficiently cross-presented when targeted with an antibody towards the DEC-205 receptor in Flt3 ligand-mobilized murine DC. Eur. J. Immunol. 40: 36–46.
. 2012. Induction of pulmonary mucosal immune responses with a protein vaccine targeted to the DEC-205/CD205 receptor. Vaccine 30: 6359–6367.
. 2010. Targeting of LcrV virulence protein from Yersinia pestis to dendritic cells protects mice against pneumonic plague. Eur. J. Immunol. 40: 2791–2796.
. 2011. Comparable T helper 1 (Th1) and CD8 T-cell immunity by targeting HIV gag p24 to CD8 dendritic cells within antibodies to Langerin, DEC205, and Clec9A. Proc. Natl. Acad. Sci. USA 108: 2384–2389.
. 2006. Dendritic cell targeting of survivin protein in a xenogeneic form elicits strong CD4+ T cell immunity to mouse survivin. J. Immunol. 177: 8410–8421.
. 2012. Targeting of the non-mutated tumor antigen HER2/neu to mature dendritic cells induces an integrated immune response that protects against breast cancer in mice. Breast Cancer Res. 14: R39.
. 2004. In vivo targeting of antigens to maturing dendritic cells via the DEC-205 receptor improves T cell vaccination. J. Exp. Med. 199: 815–824.
. 2005. Targeting of antigens to activated dendritic cells in vivo cures metastatic melanoma in mice. Cancer Res. 65: 7007–7012.
. 1995. Antigen-driven induction of CD11c on intestinal intraepithelial lymphocytes and CD8+ T cells in vivo. J. Immunol. 154: 5684–5693.
. 2003. Myeloid marker expression on antiviral CD8+ T cells following an acute virus infection. Eur. J. Immunol. 33: 2736–2743.
. 2005. Transforming growth factor-beta controls T helper type 1 cell development through regulation of natural killer cell interferon-gamma. Nat. Immunol. 6: 600–607.
. 2005. Histological analysis of CD11c-DTR/GFP mice after in vivo depletion of dendritic cells. Clin. Exp. Immunol. 141: 398–404.
. 2008. CD11c expression identifies a population of extrafollicular antigen-specific splenic plasmablasts responsible for CD4 T-independent antibody responses during intracellular bacterial infection. J. Immunol. 181: 1375–1385.
. 2009. Targeted delivery of tumor antigens to activated dendritic cells via CD11c molecules induces potent antitumor immunity in mice. Clin. Cancer Res. 15: 4612–4621.
. 1995. Targeting antigen into the phagocytic pathway in vivo induces protective tumour immunity. Nat. Med. 1: 649–653.
. 2006. Antigen targeting to dendritic cells elicits long-lived T cell help for antibody responses. J. Exp. Med. 203: 599–606.
. 1997. Removal of endotoxin from recombinant protein preparations. Clin. Biochem. 30: 455–463.
. 2010. Efficient generation of a monoclonal antibody against the human C-type lectin receptor DCIR by targeting murine dendritic cells. Immunol. Lett. 132: 69–78.
. 1995. The regulation of immunity to Leishmania major. Annu. Rev. Immunol. 13: 151–177.
. 2011. Morphofunctional characteristic of the immune system in BALB/c and C57BL/6 mice. Bull. Exp. Biol. Med. 151: 99–102. 2000. Molecular processes that regulate class switching. Curr. Top. Microbiol. Immunol. 245: 127–168. 2003. Accessibility control and machinery of immunoglobulin class switch recombination. J. Leukoc. Biol. 73: 323–332.
. 2009. Single-step antigen loading and activation of dendritic cells by mRNA electroporation for the purpose of therapeutic vaccination in melanoma patients. Clin. Cancer Res. 15: 3366–3375.
. 1998. Vaccination of melanoma patients with peptide- or tumor lysate-pulsed dendritic cells. Nat. Med. 4: 328–332. 2010. Dendritic cells in cancer immunotherapy. Eur. J. Immunol. 40: 2123–2130.
. 1999. Vaccination with mage-3A1 peptide-pulsed mature, monocyte-derived dendritic cells expands specific cytotoxic T cells and induces regression of some metastases in advanced stage IV melanoma. J. Exp. Med. 190: 1669–1678.
. 2010. Immunotherapy of cancer with dendritic cells loaded with tumor antigens and activated through mRNA electroporation. Methods Mol. Biol. 629: 405–452.
. 2011. Targeted antigen delivery and activation of dendritic cells in vivo: steps towards cost effective vaccines. Semin. Immunol. 23: 12–20. 2012. Decisions about dendritic cells: past, present, and future. Annu. Rev. Immunol. 30: 1–22.
. 2011. Targeting antigen to mouse dendritic cells via Clec9A induces potent CD4 T cell responses biased toward a follicular helper phenotype. J. Immunol. 187: 842–850.
. 2011. Antigen delivery to plasmacytoid dendritic cells via BST2 induces protective T cell-mediated immunity. J. Immunol. 186: 6718–6725.
. 2006. Intensified and protective CD4+ T cell immunity in mice with anti-dendritic cell HIV gag fusion antibody vaccine. J. Exp. Med. 203: 607–617.
. 2005. Divergent immunoglobulin g subclass activity through selective Fc receptor binding. Science 310: 1510–1512.
. 1995. T cell genetic background determines default T helper phenotype development in vitro. J. Exp. Med. 181: 713–721.